In 2006, during their 26th General Assembly, the International Astronomic Union (IAU) passed a resolution to adopt a formal definition for the term “planet”. According to this definition, bodies that orbit the Sun, are spherical, do not orbit other bodies, and have cleared their orbits were designated planets. Pluto, and other such bodies that did not meet all of these requirements, would thereafter be designated as “dwarf planets”. However, according to a new study led by Philip T. Metzger – a planetary scientists from the Florida Space Institute (at the University of Central Florida) – the IAU’s standard for classifying planets is not supported by the research literature on Pluto, and is therefore invalid. For those people who have maintained that “Pluto is still planet” for the past twelve years, this is certainly good news! Missed the planets in the dusk sky in early 2018? This summer’s astronomical blockbuster sees the return of all the classical naked eye planets in the dusk sky, in a big way. This coming July 2018 features a rare look at the solar system in profile: you can see Mercury and Venus low in the dusk looking westward immediately after sunset, with Jupiter high to the south, Saturn rising in the east, and Mars rising just behind. This isn’t a true grouping or grand conjunction, as the planets span a 170 degree swath of the ecliptic from Mercury to Mars (too bad they’re not in orbital order!) but a product of our Earthly vantage point looking out over the swath of inner solar system in the evening sky. An amazing view – Mercury through the telescope from May 5th. Image credit and copyright: Roger Hutchinson. Mercury’s July apparition – fleeting Mercury is always the toughest of the planets to catch, low to the west. -0.3 magnitude Mercury actually forms a straight line with the bright +1st/2nd magnitude stars Castor and Pollux in Gemini the Twins later this week on the evening of June 27th. Mercury reaches greatest elongation 26 degrees east of the Sun on July 12th, presenting a half illuminated, 8” disk. The angle of the evening ecliptic is canted southward in July, meaning that the position of the planets in the evening sky also favors southern viewers. July also presents another interesting mercurial challenge, as Mercury passes in front of the Beehive Open cluster (Messier 44) in the heart of the constellation Cancer on the night of July 3rd/4th. The span of the planets through late-July at dusk. Credit: Stellarium. Venus this summer – higher up at dusk, brilliant Venus rules the evening sky, shining at magnitude -4. Venus is so bright that you can easily pick it up this month before sunset… if you know exactly where to look for it. Venus reaches greatest elongation 46 degrees east of the Sun on August 17th, presenting a featureless half-illuminated disk 25” in diameter near a point known as dichotomy. Venus also flirts with the bright star Regulus (Alpha Leonis) in July, passing a degrees from the star on July 10th. Fun fact: Venus can actually occult (pass in front of) Regulus and last did so on July 7th, 1959 and will do so next on October 1st, 2044. Jupiter, with the shadow of Europa in transit from June 6th. Image credit and copyright: Ralph Smyth. Jupiter Rules – The King of the Planets, Jupiter rules the sky after darkness falls, crossing the astronomical constellation Libra the Scales. Fresh off of its May 9th opposition, Jupiter still shines at a respectable magnitude -2 in July, with a disk 36” across. Jupiter heads towards quadrature 90 degrees east of the Sun on August 6th, meaning the planet and its retinue of four Galilean moons cast their respective shadows off to one side. In fact, we also see a series of fine double shadow transits across the Jovian cloud tops involving Io and Europa starting on July 29th. …and Saturn makes five: Stately Saturn never fails to impress. Also just past its June 27th opposition, the rings are still tipped open narrowing down only slightly from last year’s widest angle of 27 degrees, assuring an amazing view. Shining at magnitude 0 and subtending 42” (including rings) in July, Saturn traverses the star-rich fields of the astronomical constellation Sagittarius the Archer this summer. Look at Saturn, and you’re glimpsing the edge of the known solar system right up until William Herschel discovered Uranus on the night of March 13th, 1781. The origins of a dust storm: Mars from late May. Image credit and copyright: Efrain Morales. Enter Mars: We saved the best for last. The Red Planet races towards a fine opposition on July 27th. This is the best approach of Mars since the historic 2003 opposition, and very nearly as favorable: Mars shines at magnitude -2.8 at the end of July, and presents a 24.3” disk. More to come as Mars approaches! And as with many an opposition, dust storm season has engulfed Mars. Be vigilant, as the ‘Red’ Planet often takes on a sickly yellowish tint during a large dust storm, and this cast will often be apparent even to the naked eye. NASA’s aging Opportunity rover has fallen silent due to the lack of sunlight and solar power, and it’s to be seen if the rover can ride out the storm. The path of the Moon – The Moon makes a good guidepost as it visits the planets in July. The first eclipse season of 2018 also begins in July, with a partial solar eclipse for Tasmania, SE Australia and the extreme southernmost tip of New Zealand on July 13th and wrapping up with a fine total lunar eclipse favoring Africa, Europe, Asia and Australia on July 27th. Note that this eclipse is only 14 hours after Mars passes opposition… we expect to see plenty of pictures of a ruddy Mars near a Blood Moon eclipse. Unfortunately, the telescopic planets Uranus and Neptune are left out of the July evening view; Uranus is currently crossing the constellation Aries and Neptune resides in Aquarius, respectively. Pluto is, however, currently in the direction of Sagittarius, and you can also wave to NASA’s New Horizons spacecraft en route to its New Year’s Day 2019 KBO destination Ultima Thule (nee 2014 MU69) near the waxing gibbous Moon on the night of July 26th. And finally, another solar system destination in Ophiuchus the Serpent Bearer beckons telescope owners in July: asteroid 4 Vesta. 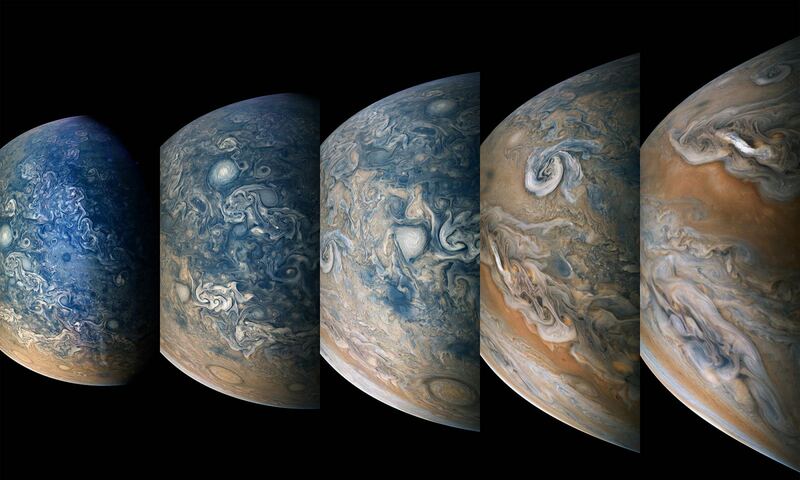 All of this is more than enough planetary action to keep planetary observers and imagers up late on forthcoming July evenings. In July of 2015, the New Horizons mission made history when it conducted the first flyby in history of Pluto. In the course of conducting its flyby, the probe gathered volumes of data about Pluto’s surface, composition, atmosphere and system of moons. It also provided breathtaking images of Pluto’s “heart”, its frozen plains, mountain chains, and it’s mysterious “bladed terrain”. These strange features showed people for the first time how radically different the surface of Pluto is from Earth and the other planets of the inner Solar System. But strangely, they also showcased how this distant world is also quite similar to Earth. For instance, in a new study, a team of researchers working on the images from the New Horizons mission noticed “dunes” on the surface of Pluto that resemble sand dunes here on Earth. The study, titled “Dunes on Pluto“, was recently published in the journal Science. The study was led by Matthew Telfer, a Lecturer in Physical Geography from the University of Plymouth, with significant contributions provided by Eric J. R. Parteli and Jani Radebaugh – geoscientists from the University of Cologne, and Brigham Young University, respectively. They were joined by members from the Carl Sagan Center at the SETI Institute, NASA’s Ames Research Center, the Lowell Observatory, the Southwest Research Institute (SwRI), the National Optical Astronomy Observatory, the Massachusetts Institute of Technology (MIT), the Johns Hopkins University Applied Physics Laboratory (JHUAPL), and multiple universities. On Earth, dunes are formed by wind-blown sand that create repeated ridges in the desert or along beaches. Similar patterns have been observed along river beds and alluvial plains, where water deposits sediment over time. In all cases, dune-like formations are the result of solid particles being transported by a moving medium (i.e. air or water). Beyond Earth, such patterns have been observed on Mars, Titan, and even on Comet 67P/Churyumov-Gerasimenko. However, when consulting images from New Horizons probe, Telfer and his colleagues noted similar formations in the Sputnik Planitia region on Pluto. This region, which constitutes the western lobe of the heart-shaped Tombaugh Regio, is essentially a massive ice-covered basin. 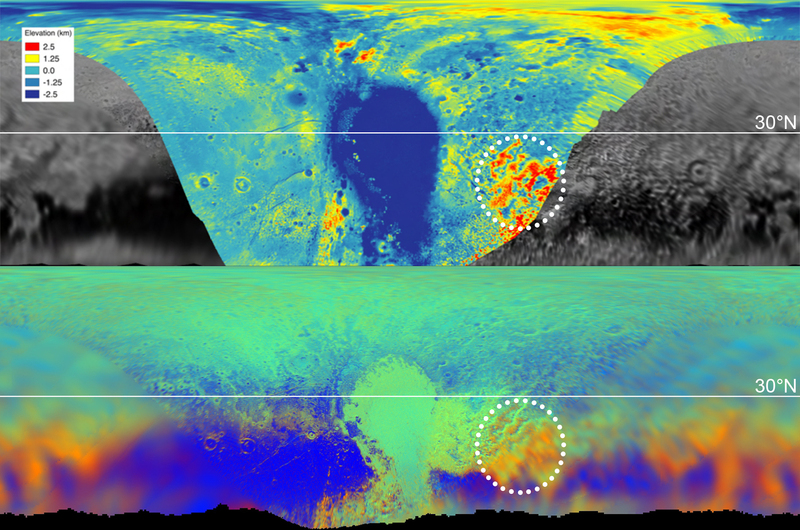 Already, researchers have noted that the surface appears to consist of irregular polygons bordered by troughs, which appear to be indications of convection cells. Another interesting feature is the dark streams that are a few kilometers long and are all aligned in the same direction. But equally interesting were the features that Telfer and his team noticed, which looked like dunes that ran perpendicular to the wind streaks. This indicated that they were transverse dunes, the kinds that pile up due to prolonged wind activity in the desert. To determine if this was a plausible hypothesis, the researchers constructed models that took into account what kind of particles would make up these dunes. They concluded that either methane or nitrogen ice would be able to form sand-sized grains that could be transported by typical winds. They then modeled the physics of Pluto’s winds, which would be strongest coming down the slopes of the mountains that border Sputnik Planum. However, they also determined that Pluto’s winds would not be strong enough to push the particles around on their own. This is where sublimation played a key role, where surface ice goes from a solid phase directly to a gas when warmed by sunlight. This sublimation would provide the upward force necessary to lift the particles, at which point they would be caught by Pluto’s winds and blown around. In addition to showing that Pluto, one of the most distant objects in the Solar System, has a few things in common with Earth, this study has also shown just how active Pluto’s surface is. “It shows us that not only is Pluto’s surface affecting its atmosphere, the converse is also true,” said Dr. Telfer. “We have a really dynamic world’s surface, so far out in the solar system. On top of that, understanding how dunes can form under Pluto’s conditions will help scientists to interpret similar features found elsewhere in the Solar System. For example, NASA is planning on sending a mission to Titan in the coming decade to study its many interesting surface features, which include its dune formations. And many more missions are being sent to explore the Red Planet before a crewed mission takes place in the 2030s. Knowing how such formations were created are key to understanding the dynamics of the planet, which will help answer some of the deeper questions about what is taking place on the surface. When it made its historic flyby of Pluto in July of 2015, the New Horizons spacecraft gave scientists and the general public the first clear picture of what this distant dwarf planet looks like. In addition to providing breathtaking images of Pluto’s “heart”, its frozen plains, and mountain chains, one of the more interesting features it detected was Pluto’s mysterious “bladed terrain”. According to data obtained by New Horizons, these features are made almost entirely out of methane ice and resemble giant blades. At the time of their discovery, what caused these features remained unknown. But according to new research by members of the New Horizons team, it is possible that these features are the result of a specific kind of erosion that is related to Pluto’s complex climate and geological history. Ever since the New Horizons probe provided a detailed look at Pluto’s geological features, the existence of these jagged ridges has been a source of mystery. They are located at the highest altitudes on Pluto’s surface near it’s equator, and can reach several hundred feet in altitude. In that respect, they are similar to penitentes, a type of structure found in high-altitude snowfields along Earth’s equator. These structures are formed through sublimation, where atmospheric water vapor freezes to form standing, blade-like ice structures. The process is based on sublimation, where rapid changes in temperature cause water to transition from a vapor to a solid (and back again) without changing into a liquid state in between. With this in mind, the research team considered various mechanisms for the formation of these ridges on Pluto. But unlike on Earth, the erosion of these features are related to changes that take place over the course of eons. This should come as no surprise seeing as how Pluto’s orbital period is 248 years (or 90,560 Earth days), meaning it takes this long to complete a single orbit around the Sun. In addition, the eccentric nature of it orbit means that its distance from the Sun ranges considerably, from 29.658 AU at perihelion to 49.305 AU at aphelion. When the planet is farthest from the Sun, methane freezes out of the atmosphere at high altitudes. And as it gets closer to the Sun, these ice features melt and turn directly into atmospheric vapor again. As a result of this discovery, we now know that the surface and air of Pluto are apparently far more dynamic than previously thought. Much in the same way that Earth has a water cycle, Pluto may have a methane cycle. This discovery could also allow scientists to map out locations of Pluto which were not photographed in high-detail. When the New Horizons mission conducted its flyby, it took high-resolution pictures of only one side of Pluto – designated as the “encounter hemisphere”. However, it was only able to observe the other side at lower resolution, which prevented it from being mapped in detail. But based on this new study, NASA researchers and their collaborators have been able to conclude that these sharp ridges may be a widespread feature on Pluto’s “far side”. The study is also significant in that it advances our understanding of Pluto’s global geography and topography, both past and present. This is due to the fact that it demonstrated a link between atmospheric methane and high-altitude features. As such, researchers can now infer elevations on Pluto by looking for concentrations of methane in its atmosphere. Not long ago, Pluto was considered one of the least-understood bodies in our Solar System, thanks to its immense distance from the Sun. However, thanks to ongoing studies made possible by the data collected by the New Horizons mission, scientists are becoming increasingly familiar with what its surface looks like, not to mention the types of geological and climatological forces that have shaped it over time. It was two years ago this morning that we awoke to see the now iconic image of Pluto that the New Horizons spacecraft had sent to Earth during the night. You, of course, know the picture I’m talking about – the one with a clear view of the giant heart-shaped region on the distant, little world (see above). 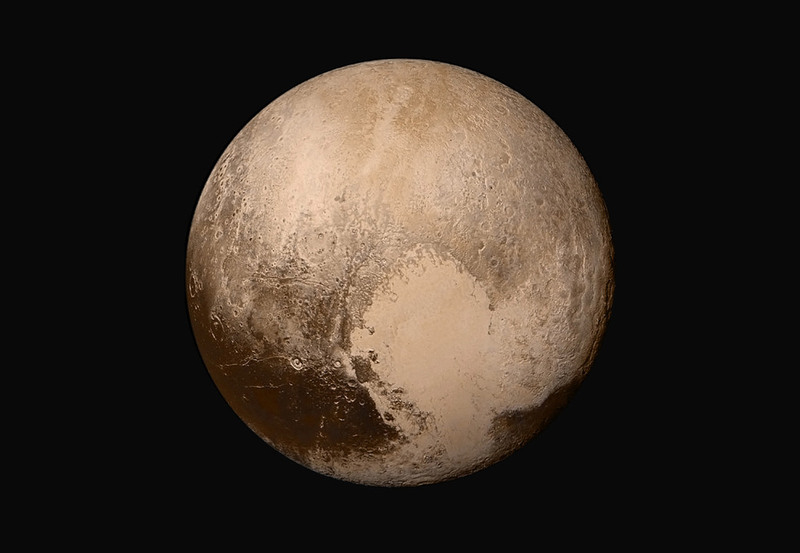 This image was taken just 16 hours before the spacecraft would make its closest approach to Pluto. Then, during that seemingly brief flyby (after traveling nine-and-a-half years and 3 billion miles to get there), the spacecraft gathered as much data as possible and we’ve been swooning over the images and pondering the findings from New Horizons ever since. All the images have shown us that Pluto is a complex world with incredible diversity, in its geology and also in its atmosphere. While the iconic “heart” image shows a clear and cloudless view of Pluto, a later image showed incredible detail of Pluto’s hazy atmosphere, with over two dozen concentric layers that stretches more than 200 km high in Pluto’s sky. 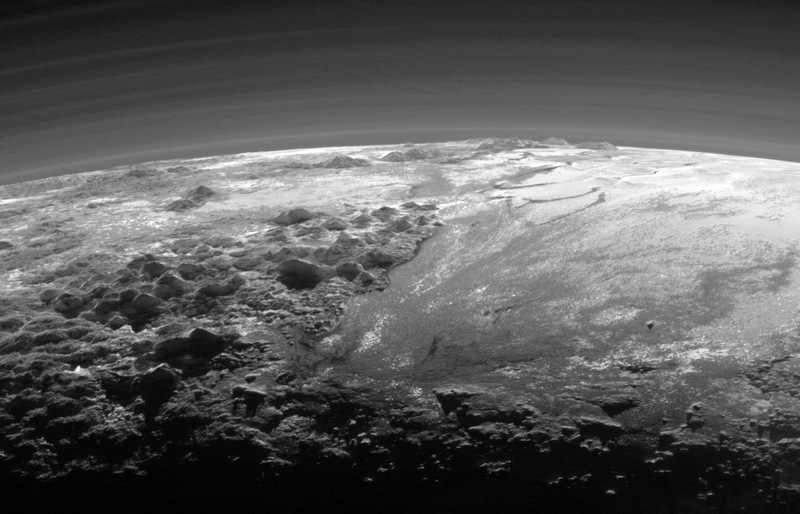 With all those layers and all that haze, could there be clouds on Pluto too? The smooth expanse of the informally named Sputnik Planum (right) is flanked to the west (left) by rugged mountains up to 11,000 feet (3,500 meters) high, including the informally named Norgay Montes in the foreground and Hillary Montes on the skyline. The backlighting highlights more than a dozen layers of haze in Pluto’s tenuous but distended atmosphere. Credit: NASA/JHUAPL/SwRI. This is a question Stern and his fellow scientists have been asking for a long time, actually, as they have been studying Pluto for decades from afar. Now with data from New Horizons, they’ve been able to look closer. While Stern and his colleagues have been discussing how they found possible clouds on Pluto for a few months, they have now detailed their findings in a paper published last month. They explained that evidence for this came primarily from the “high amplitude and temporal stability of Pluto’s lightcurve,” however, because no high spatial resolution imagery of Pluto was possible before New Horizons, it remained to be seen if clouds occur over a small fraction of Pluto’s surface area. 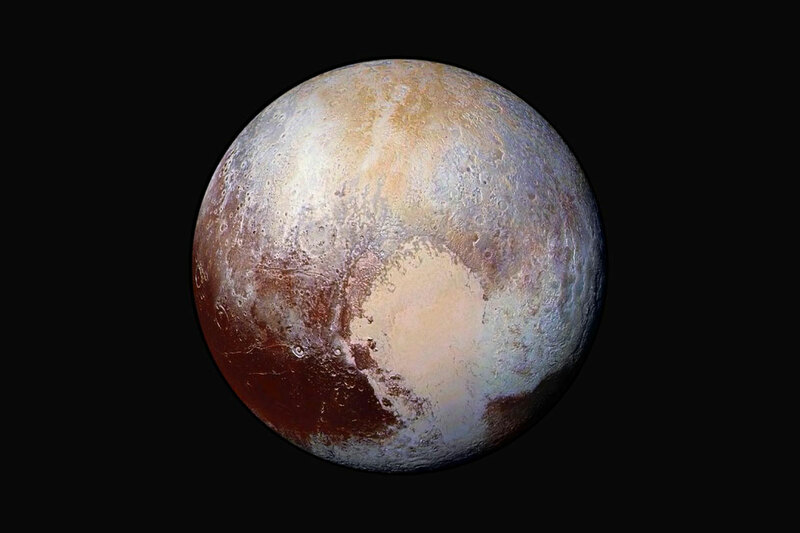 But now with flyby images in hand, the team set out to do searches for clouds on Pluto, looking at all available imagery from the Long Range Reconnaissance Imager and the Multispectral Visible Imaging Camera, looking at both the disk of Pluto and near and on the limb. Since an automated cloud search was nearly impossible, it was all done by visual inspection of the images by the scientists. They looked for features in the atmosphere that including brightness, fuzzy or fluffy-looking edges and isolated borders. 6, 7) were taken by LORRI. Arrows indicate each PCC. Credit: Stern et al, 2017. In all, they found seven bright, discrete possible cloud candidates. The seven candidates share several different attributes including small size, low altitude, they all were visible either early or late in the day local time, and were only visible at oblique geometry – which is basically a sideways look from the spacecraft. Also, several cloud candidates also coincided with brighter surface features below, so the team is still pondering the correlation. While haze was detected as high as 220 km, the possible clouds were found at very low altitudes. Stern told Universe Today that these possible, rare condensation clouds could be made of ethane, acetylene, hydrogen cyanide or methane under the right conditions. Stern added these clouds are probably short-lived phenomena – again, likely occurring only at dawn or dusk. A day on Pluto is 6.4 days on Earth. But all in all, they concluded that at the current time Pluto’s atmosphere is almost entirely free of clouds – in fact the dwarf planet’s sky was 99% cloud free the day that New Horizons whizzed by. “But if there are clouds, it would mean the weather on Pluto is even more complex than we imagined,” Stern said last year. If you’re dreaming of a Pluto orbiter, you can read about some possibilities of how to do it in our article from May of this year. Once held to be the outermost planet of the Solar System, Pluto‘s designation was changed by the International Astronomical Union in 2006, owing to the discovery of many new Kuiper Belt Objects that were comparable in size. In spite of this, Pluto remains a source of fascination and a focal point of much scientific interest. And even after the historic flyby conducted by the New Horizons probe in July of 2015, many mysteries remain. What’s more, ongoing analysis of the NH data has revealed new mysteries. For instance, a recent study by a team of astronomers indicated that a survey by the Chandra X-ray Observatory revealed the presence of some rather strong x-rays emissions coming from Pluto. This was unexpected, and is causing scientists to rethink what they thought they knew about Pluto’s atmosphere and its interaction with solar wind. In the past, many Solar bodies have been observed emitting x-rays, which were the result of interaction between solar wind and neutral gases (like argon and nitrogen). Such emissions have been detected from planets like Venus and Mars (due to the presence of argon and/or nitrogen in their atmospheres), but also with smaller bodies like comets – which acquire halos due to outgassing. Ever since the NH probe conducted its flyby of Pluto in 2015, astronomers have been aware that Pluto has an atmosphere which changes size and density with the seasons. Basically, as the planet reaches perihelion during its 248 year orbital period – a distance of 4,436,820,000 km, 2,756,912,133 mi from the Sun – the atmosphere thickens due to the sublimation of frozen nitrogen and methane on the surface. The last time Pluto was at perihelion was on September 5th, 1989, which means that it was still experiencing summer when NH made its flyby. While studying Pluto, the probe detected an atmosphere that was primarily composed of nitrogen gas (N²) along with methane (CH4) and carbon dioxide (CO²). Astronomers therefore decided to look for signs of x-ray emissions coming from Pluto’s atmosphere using the Chandra X-ray Observatory. “Given that most pre-encounter models of Pluto’s atmosphere had predicted it to be much more extended, with an estimated loss rate to space of ~1027 to 1028 mol/sec of N² and CH4… we attempted to detect X-ray emission created by [solar wind] neutral gas charge exchange interactions in the low density neutral gas surrounding Pluto,” they wrote. However, after consulting data from the Advanced CCD Imaging Spectrometer (ACIS) aboard Chandra, they found that x-ray emissions coming from Pluto were greater than what this would allow for. In some cases, strong x-ray emissions have been noted coming from other smaller objects in the Solar System, which is due to the scattering of solar x-rays by small dust grains composed of carbon, nitrogen and oxygen. For the time being, the true cause of these x-ray emissions is likely to remain a mystery. They also highlight the need for more research when it comes to this distant and most massive of Kuiper Belt Objects. 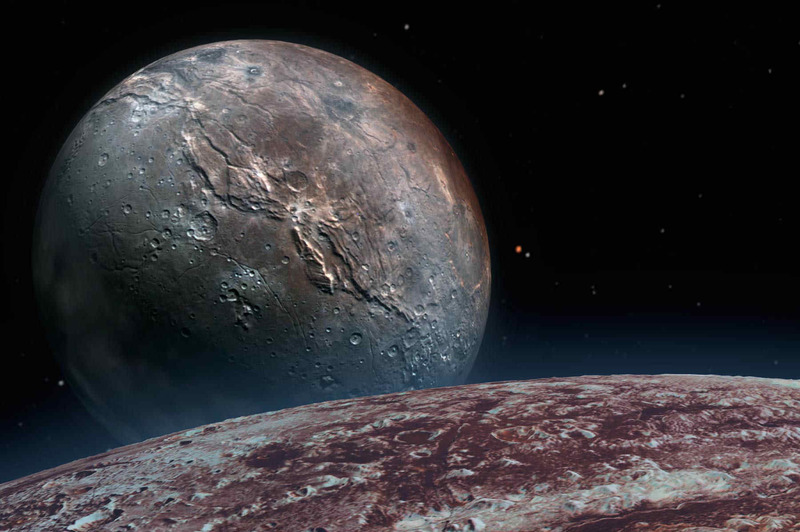 Luckily, the data provided by the NH mission is likely to be poured over for decades, revealing new and interesting things about Pluto, the outer Solar System, and how the most distant worlds from our Sun behave. The study – which was accepted for publication in the journal Icarus – was conducted by astronomers from the Johns Hopkins University Applied Physics Laboratory (JHUAPL), the Harvard-Smithsonian Center for Astrophysics, the Southwest Research Institute (SwI), the Vikram Sarabhai Space Center (VSCC), and NASA’s Jet Propulsion Laboratory and Ames Research Center.